Brown wood moulding with black accents frame overall size is a 15 1/2 x 22 1/2 inch unit. 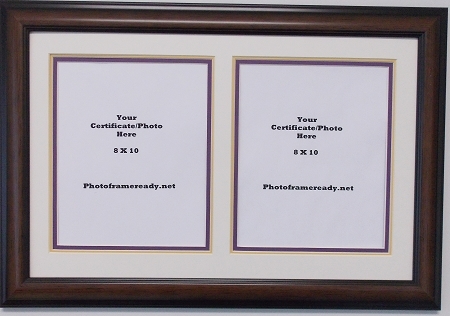 Triple mats hold Double 8 x 10 certificate, diplomas or photos. Top mat creme with gold and purple bottom mat. Unit includes mounting board, hinging tape,glass front and a wall hanging system. Can hang either vertical or horizontal.